"Feudal Ops" is a BRPG digital boardgame conversion and [urlx=http://www.boardgamegeek.com/thread/555772/feudal-ops-a-re-theme-of-nexus-ops]complete re-theme[/urlx] of the [urlx=http://www.boardgamegeek.com/boardgame/15363/nexus-ops]"Nexus Ops" boardgame[/urlx], by Charlie Catino (published by Avalon Hill in 2005, but now out-of-print). It is played using the rules from Nexus Ops, which can be downloaded from the [urlx=http://www.wizards.com/default.asp?x=ah/downloads]Avalon Hill website[/urlx]. "Feudal Ops" changes the "Nexus Ops" game setting from one of science-fiction to one of warring medieval factions, and it does so without changing (or adding) any game rules. 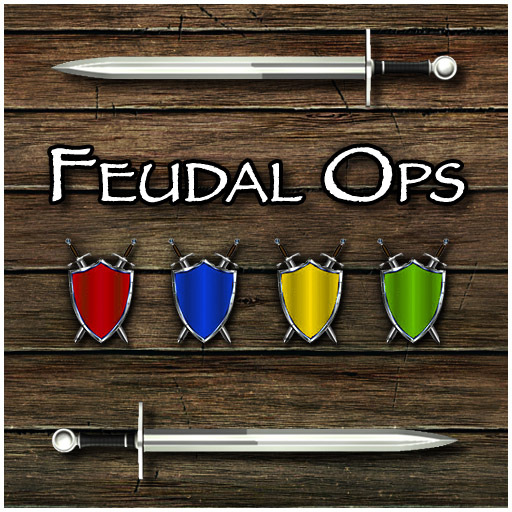 "Feudal Ops" is a light-medium war game. The game boasts a hexagonal board that is dealt differently every time. Players assume the role of medieval Lords that battle each other for control of the region's wealth and compete with each other for the King's favor. By winning battles and fulfilling Secret Missions, the players can obtain victory points. The first person to reach the required number of victory points wins the game. The above download contains everything needed to play the game if you already have at least one GM Client license (v1.6m or higher). For multiplayer games, the extra players will need a Player Client or a GM Client. A player can also use the free BRPG Demo if the person hosting the game has a Floating License for them to use. PS: Eleven preview images are located in this forum thread on boardgamegeek.com. Click on each thumbnail to view the image at a larger size (note that only users with an account at BGG will be able to see the images at full resolution). Last edited by heruca on Mon May 16, 2011 10:06 pm, edited 1 time in total. 2) This free game conversion differs from other game conversions I've done in that it may not always remain available for download, and even if you already downloaded it, it may cease to work. There is a "kill switch" in place just in case Avalon Hill/Hasbro has a problem with this game conversion (not very likely, since this is a total re-theme with all-new artwork, and I am not including the game rules). By the way, if you're interested in playing Feudal Ops and are looking for opponents, please look here. "Nexus Ops is one of the absolute best American games of the past decade...Some games lose their lustre over time, others you get tired of, but Nexus Ops has what it takes to stick around and I think it'll be with us for some time to come." "This is the proof that games with an epic feel, strategy, tactics, streamlined rules and theme can be done." "I believe this is the greatest game of its genre, it has made games obsolete and I suspect will continue to dominate the field for years." "The only game I bought a BACK UP COPY of and am leaving on a shelf in shrink until my original set wears-out. Tactical, strategic, tense with good players, it never fails to entertain me." "The more I play it, the more I love it. It's simple enough to teach someone in a few minutes, plays relatively quickly and works well with 2, 3, or 4 players. The random board and secret missions make every game seem fresh and the diversity in the 6 different units is just great." "Nexus Ops is one of the best conflict games on the market as it offers a variable board, equal balance for any number of players and some neat mechanics that encourage aggression (keeps the play time down) and variability (mission cards)." "Fabulous. As far as I'm concerned, this game definitively replaces every version of Risk and Axis & Allies ever created, offering better, deeper and faster gameplay." "Instead of a game that takes forever to play and people turtle up in their home base areas, this one is all about going out and grabbing VPs from different spaces and conditions according to scoring cards you draw. This means there is tons of player interaction and all-out attacking." "This game should replace RISK in every family game collection. It is difficult to convince people to give it a chance because of the theme." "It's the best parts of Axis and Allies, Risk, and even a little Twilight Imperium." "The semi-random board, random exploration tile placement, the different but not complex units and the secret missions all add up to a great gaming experience." I have uploaded a new version of the Feudal Ops zip file linked to in the opening post. This new version adds support for BRPG v1.6m, and fixes a couple of mistakes & omissions that were in the original release. I wasn't too happy with the Woods tile in this digital conversion. It was serviceable, but not very attractive, and it didn't seem to mesh well with the other tiles. So I created a new one, and am posting it here in case anyone else wants to use it. To install, unzip the attached file and place the resulting folder in BRPG's "Objects" folder. Then use BRPG's "Batch Import" command and select this folder. If you already had a "Feudal Ops" Encounter loaded, you will need to use the "Purge/Refresh Artpacks" command to see the new Woods tiles.